Continental unveils a robotic quadruped system to overcome the challenge of last meter delivery. 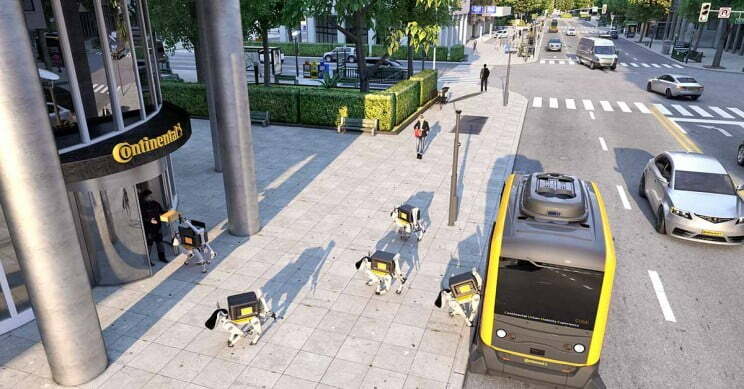 This week at Continental’s news conference for CES 2019, the autonomous vehicle sensor and equipment company introduced their long term plan for developing smart city transportation infrastructure—but it was the robot delivery dogs that stole the show. The problem that Continental is trying to solve is one of the oldest challenges in automation: Last Meter Delivery. Getting a package to the curb in front of your house is surprisingly easy, getting it to your mailbox is devilishly hard. This is why most of us still have a mail person or human driver who makes the actual delivery while almost the entire delivery stream has been automated for at least a decade. Humans can easily navigate terrain and obstacles that can trip robots up and they can assess safety conditions in a way that robots may not be able to, among other advantages. What Continental has managed to do, however, is to develop a delivery network solution that could actually accomplish what countless other companies from unknown start-ups to Amazon have struggled to address. Part of the advantage of Continental’s approach is that it leverages a transportation infrastructure they are already in the process of rolling out, the QUbE autonomous shuttles. As part of their seamless point-to-point mobility network, their autonomous shuttles have already been shown to effectively transport people where they need to go, keep them engaged, and get them to their destination safely. Once these shuttles begin to be deployed en masse, cities will adopt dedicated lanes for shuttles like the QUbE and Transdev’s i-Cristal. This will make it much easier to establish a delivery network over larger distances down to the last mile—the point where a package arrives at your local post office or delivery facility—and then down to the last meter, getting the package from the autonomous vehicle to your door or parcel locker safely. Whether the engineers at Continental had a smirk on their face when designing their quadrupedal parcel delivery system is anyone’s guess, but building their robot to model a dog is a wise move. First, quadrupedal robots are considerably more stable than bipedal robots and quadrupeds can navigate terrain that will easily bog down wheeled vehicles. They are stronger and can carry heavier parcels than would be practical for drones to carry, and the unintimidating profile of the robot make it an exceptional option for autonomous, last meter delivery to peoples homes. As fun as robot delivery is to talk about, we cannot separate it from the serious investment being made to revitalize our urban infrastructures. Robot parcel delivery is only one gear in a much larger, much smarter machine that Continental is building, though it could very well become the most visible face of that system for most people. Considering the relationship most people have with their parcel delivery and mail persons, it might take time for such a system to be fully deployed, but once it does, we can expect that Continental’s robot delivery dogs will become a ubiquitous and likely beloved part of our neighborhoods in the years to come.